Artensoft Photo Collage Maker 1.3 released! Artensoft Photo Collage Maker 1.2 released! Thanks to a significant improvement of the algorithm of collage-building, collages have become perfect in their refinement and colors! Attention: to install version 1.2 you need to completely uninstall the previous version of the program. This is due to significant changes in the program, including changes to saving the database of cell-images. 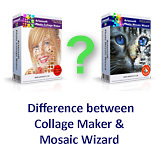 Artensoft Photo Collage Maker 1.1 released! Artensoft Photo Collage Maker 1.0 released!